Looking forward to iOS 7.1 and those cool features? These iOS updates don’t have any of that, sigh, not even a little. iOS 7.0.6 and iOS 6.1.6, which pretty much do one thing and one thing only, are available right here, right now. 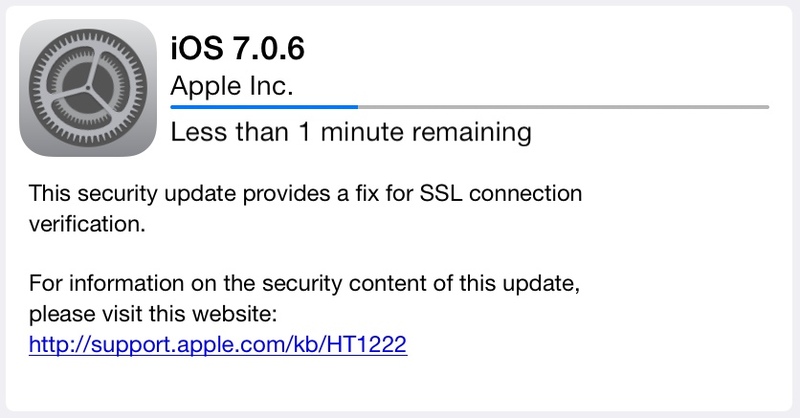 Just three weeks after releasing iOS 7.0.5, which fixed a network provisioning issue in iPhone 5s and iPhone 5c configurations sold (legally) in China, Apple is back with another update. And, this latest pair of iOS updates is just as exciting. 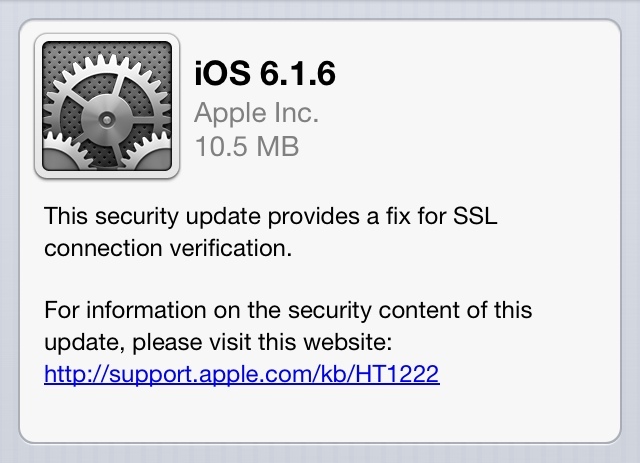 iOS 7.0.6 and iOS 6.1.6 offer a patch for an obviously critical security issue — here comes some sizzle for your Friday — SSL connection verification. With more than 80 percent of iPhone, iPod touch and iPad users already on iOS 7.0.x, most of us will be installing iOS 7.0.6. For iPhone 3GS and fourth generation iPod touch users, there is iOS 6.1.6. As of this writing, no word on jailbreak compatibility of these updates. Obviously, we have to wait a bit longer before iOS 7.1 arrives — ’twas expected in March and, on that front, today’s releases don’t change anything.